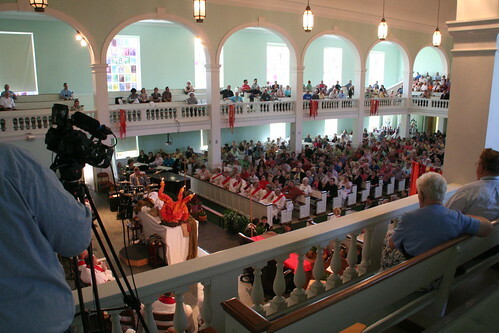 A Proposed Resolution at the 2011 session of the West Virginia Annual Conference (#wvac2011) seeks to renew our current quadrennial focus on Evangelism. The proposed resolution is entitled “Making Disciples Who Make Disciples” to be the 2012-2016 Quadrennial Focus. I will be voting no on this measure for several reasons. The Church exists to serve others. My main objection to the Resolution is its self-centeredness. The purpose of our current emphasis, as well as the crux of the renewed proposal is an increase of professions of faith. That’s all well and good. But the end purpose of the church is not self-service but service to others as the Body of Christ. This image of the Body of Christ is so important to the purpose and identity of the Church. What did Jesus do with his body? He gave it over to death for the salvation of others. Our belief in resurrection includes an acknowledgement of death. As the Body of Christ, the Church must serve others, even if it hurts, even if it costs us our life. Did anyone come to love church because it cared for itself? No. One comes to love the Church when the Church shares its blessedness. Finally, Jesus himself warns that “those who want to save their lives will lose it, and those who lose their lives for my sake will find it” (Matthew 16:25). Twelve Years of Self-Indulgence. The Quadrennial focus from 2004-2008 was on Stewardship. We had some nice Stewardship moments at the AC session which taught us about stewardship of earth, time, etc. But let’s not kid ourselves. The main focus was on Financial stewardship, namely the paying out of apportionments. I arrived in 2006 and witnessed 2 years of this. Then in 2008 the Quadrennial emphasis turned to Evangelism. We have had workshops, we’ve read lots of megachurch pastors’ books, we’ve had two BIG (expensive) rallies based on the Great Commission. The AC session almost always includes moaning about the lack of professions of faith. For 8 years already, we’ve focused on our money and on our membership. We do count number of people served on our statistical reports, but I’ve never heard it mentioned again. Going more than a decade emphasizing one’s self seems over-indulgent. Going over a decade while NOT focused on helping the needy is negligent. Serving others is good for the soul. What I learned from my brief but formative time in mission service is that when you serve another, you yourself are blessed. Service is a path to sanctification. I found that by serving another, I had to come to terms with my own sins, disappointments and failures. I had to come to terms with God’s purpose for my life. I had to stop living so selfishly. This process is still ongoing. Annual Conference sessions can be bewildering. On the one hand, we have wonderful worship. Music is solid, preaching is sound, the Memorial Service is moving and the Ordination service is inspiring. The business sessions often feel like an exercise in futility. We bemoan our financial state and our dwindling numbers. We squeeze in blessings for VIM teams, boy scouts and children’s conference. We discontinue congregations and sell off property with nary a notice. The budget conversation and the Cabinet presentations seem to loom the largest, and those tend toward the negative. We lack money. We need more people. Insurance is too expensive. Churches aren’t paying their apportionments. Conference is always tiresome (especially with a small child). And it’s overall benefit is a bit vague. Moreover, I’m not sure that the Conference believes that God loves us. [I’ve never put it that way to myself before, but now I can’t shake this concern.] We can get so down on ourselves. For this reason, I think it is vital to the overall spirit of the Conference to retrain its focus on service. Who wants to be part of a church that’s always counting its iniquities? The need is great. The need for locally active churches is great in West Virginia. We are poor and rural, with a bevy of bad habits. Many of our struggles are self-inflicted: alcoholism, obesity, smoking-related health problems, environmental matters that challenge our health. West Virginia’s children are suffering as much as our adults. Perhaps God could raise up a people concerned for the well-being of the inhabitants of this beautiful but rugged land. If I were God, I would put a depot of hope and goodness in every city, town and hamlet in this great state. I would instill the people at the depot with a sense of joyful obedience and command them to love their neighbors as themselves. I would enrich the people at this depot with a wild and ancient story of redemption, sacrifice and hope. I would equip this depot with varying gifts so that they can do many different things. I’d give each depot its own personality, because I’m a God that loves variety. I would instill in the people at the depot a sense of brotherhood and mutual responsibility so that everyone is taken care of. I’d give them all heaping helpings of my own Spirit so that they can conquer any challenge and sing songs of victory and praise. I would call these depots churches. I would be present at all of these depots. I would call the people my children and they would not fear nor worry. God wants us to do more than serve ourselves. Barring some greater revelation, I will be voting NO on this measure. Right on, Christopher. Thank you, thank you, thank you. This is why I am a Christian, this is where I wish my church to focus: to serve people in need with joy and gratitude. It should be the focus of every church. Thank you for your leadership.